Alfred Hitchcock was a master-crafts man of cinema. Few can create tension like Hitchcock and he had a keen understanding of how this could pay-off on-screen. His films also have a wry streak that adds an extra dimension and ups the entertainment value. The Lady Vanishes (based on the novel by The Wheel Spins by Ethel Lina White) has the perfect blend of both, which helps make it a prime piece of Hitchcock. Starring Margaret Lockwood and Michael Redgrave, this 1938 effort involves the disappearance of an elderly passenger on a trans-European train. Hitchcock revels in the one location as Lockwood and Redgrave search the train as it roars through Europe. Sidney Gilliat and Frank Launder’s script crackles with wit as Lockwood and Redgrave verbally spar against each other whilst attempting to uncover what is happening. Rich and layered, The Lady Vanishes has a vibrant kinetic energy that mirrors the film’s speeding train. Lockwood and Redgrave hold the attention but the film is also peppered with fun and interesting supporting characters. The most notable of these being Charters and Caldicott (Naunton Wayne and Basil Radford), characters so popular that they continued their cinematic adventures in other movies. 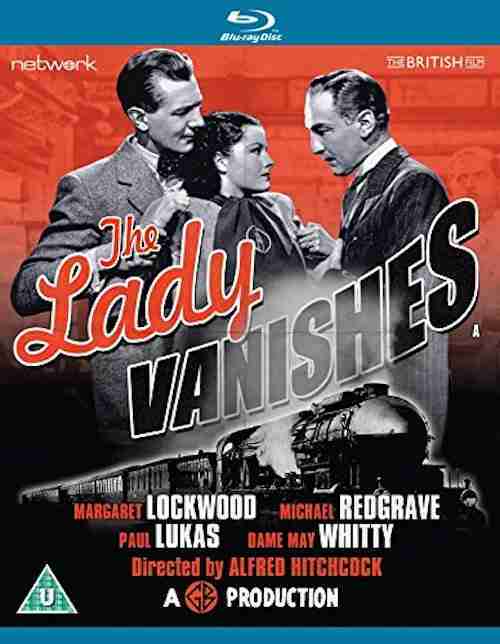 The Lady Vanishes is one of the last movies that Hitchcock made in the UK before moving to Hollywood. You can see him pushing the limitations of his budget and skill here – the opening tracking shot is a prime example of Hitchcock pushing the boundaries of fluid camera and model work. You can feel the director wanting to break-out and play on a bigger cinematic canvas. Picking one of Alfred Hitchcock’s finest is never easy, but The Lady Vanishes must surely rank in his top ten. Thrilling and fun, It has everything you would want from the ‘Master of Suspense’, including one of his trademark cameo appearances – but I’m not going to tell you where that is. You’ll just have to watch it for yourself. The Lady Vanishes has a great blu-ray transfer but there’s little on offer in the special features realm. However, you do get an introduction from Charles Barr and an image gallery.